Everywhere Carol and I go — well, maybe not everywhere — we look for old barns. These are common scenes down country roads across America. And how many square dances filled the barnyard with music there? There’s a reason why the classic country-music show called the “Grand Ole Opry” is staged in a Nashville, Tennessee, auditorium that is decorated like a barn. 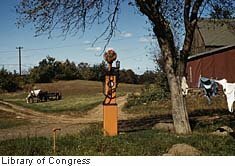 In a bygone era when the nation lived closer to the land, the first thing a farmer built after he bought a new spread was not a farmhouse but a barn, using wood sawed from timber felled right on the farm, or, especially in rocky New England, stones unearthed nearby. Heavy stones, too, and thick-cut timber fitted into a “post and beam” skeleton, so the structure would withstand storms and the weight of animals as big as Clydesdale draft horses, and their feed. That feed could be dropped directly into the animals’ stalls from above through trap doors. The farmer and his neighbors would gather on a piece of high ground to raise a sturdy, all-in-one structure to shelter his livestock, store his grain, and protect his wagon. 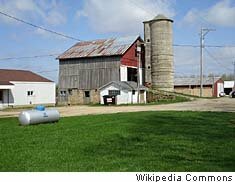 Alongside many a barn, too, rose simple corn cribs or much taller silos. The latter stored silage — fermented green fodder such as chopped hay, alfalfa, clover, or shredded corn — that compacted tightly, keeping out air and pests and preventing spoilage. Silage seems rank to humans, but cud-chewing animals like cattle and sheep find it tasty. 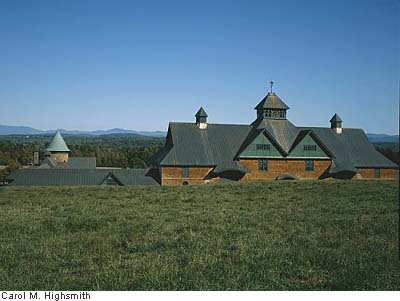 Big barns also often included a blacksmith’s shop; a tack room where saddles and bridles and such were kept and repaired; an attached milkhouse where milk was stored for delivery; and sometimes a space equipped with an iron “squeeze chute” that could catch and hold a large animal for examination or veterinary treatment. Barns must seem cozy and luxurious to the animals that are sheltered there, compared to conditions outside. But they’re hardly equipped with all the comforts of a human’s home. If you’ve ever been asked whether you were “raised in a barn,” you have a sense how drafty even the snuggest barn can be. And odors from animal waste, awaiting a good washdown or mucking, while presumably quite tolerable to the animals and a reality of farm life to their owners, are hardly sylvan scents to the unaccustomed. There’s a reason why even rural folk prefer the upwind side of a pig farm, in particular. I should pause here to make it clear that, as a child of suburbia, I have visited and very much appreciate the strength and symbolism of barns and the men and women who built and maintain them. But most of what I know about these iconic structures came from my mother and uncle, raised in “the country” in Pennsylvania’s Allegheny Mountains, from childhood stories like Laura Ingalls Wilder’s Little House on the Prairie, from numerous farm visits — ever watching where I stepped — and from a number of neat Web sites. But I must still channel a bit of their poor Scalp Level, Pennsylvania, farm — or my ancestors’ native Wales — since every time I’m in the country, I find myself plucking a grain stem, sticking it between my teeth, and ambling down the road, kicking rocks. Ah, yes. As the number of family farms dwindles before the onslaught of consolidation and suburban sprawl, many barns that survive have become nostalgic landmarks, even to those who have never set foot in one. Early barns, built with great sweat and affection, reflected the heritage of their builders. Norwegians and Swedes built “bank barns” with a lower entrance and, on the opposite side, a long, earthen ramp that enabled wagons loaded with feed to drive directly into the upper level. Below you could thresh grain or keep livestock — plus a family of mousers — cats that keep the rodents in check. Scots-Irish farmers erected crib barns with pig or cattle stalls and covered them with tin or asphalt roofs. 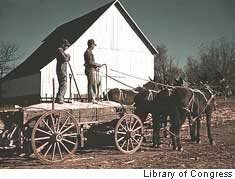 Western farmers with large cattle herds topped their barns with high “hip” or gambrel roofs — bent a bit like a horse’s hind leg — that greatly increased the capacity of the haymows and often included an overhang equipped with a pulley to hoist hay bales into the loft. Czechs and Russians had an affinity for house-barn combinations. Cedar shingles and bay windows — for ventilation — were common New England adornments. Germans and Swiss, whom many early Americans mistakenly called “Pennsylvania Dutch” because they spoke Deutsch, built many a “Pennsylvania barn” or “Dutch barn,” notable for their gable roofs, cantilevered “forebays,” or upper floors that projected past the foundation line. This provided a bit of shade and covered working space outside. Most Dutch barns also included three or four distinctive ventilators in decorative cupolas, which pulled moisture and heat from the buildings. George Washington, the nation’s first president and a prominent Virginia farmer, discovered the advantages of a round barn or round-appearing structure with 12 or 16 sides. They’re a favorite of mine, and I’ll have more to say about them anon. advertising salesman came along. 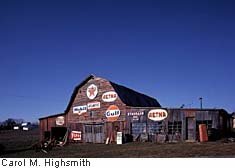 He would see to it that the barn got painted if the owner would permit him to emblazon it with a grandiose testament to brands of chewing tobacco or patent medicine, or promotions of nearby waterfall or rock-formation attractions. 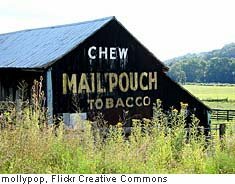 “Red Man,” “Mail Pouch” and “See Rock City” barns are still somewhat plentiful in the mid-South. Such is their nostalgic appeal that people treasure them, photograph them like crazy, and keep some of them freshly painted. By the way, if you’re tempted to grab a brush, you should know that it can take a single person three summers and 200 liters [53 gallons] of paint to cover a good-sized barn. Check back with me on Twitter in a month or two and let me know how it’s going. “Hex” signs, weather vanes, and lightning rods were other decorative touches. 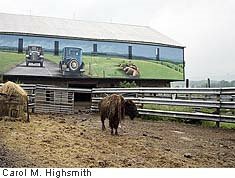 Barns became the perfect “canvas” for oversized portraits, animal likenesses, and fanciful designs, as you can see in a couple of Carol’s photos. We saw several in Ohio that carry the state outline and a faded plug for Ohio’s 2003 bicentennial. 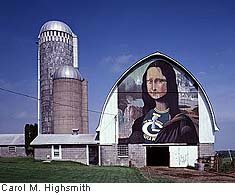 Of course, barn aficionados like me would argue that barns themselves are works of art. 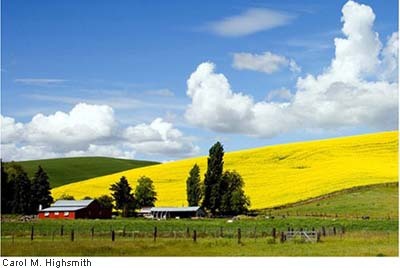 Can you find anything not to like about this beautiful scene on a rapeseed farm in Idaho? I’m not sure why a tense, often fast-paced sporting contest is called a “barn burner,” since the term traces to an old Dutch story about a fellow who found the perfect way to rid his barn of rats. He burned it down. Thousands of barns have been left to rot as farmers turned to sturdier, climate-controlled metal sheds that could hold large machinery. 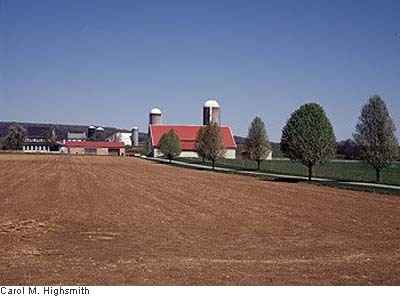 When small farms are combined, fewer barns are needed. 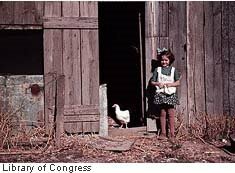 Many farmers also lacked the capital or insurance to rebuild barns that burned, sagged, or blew down. Others had no reason to, knowing that their children, gone to the city for good, would want no part of long hours and backbreaking farm work. So they left the old barn to termites and windstorms, vandals and the kudzu. 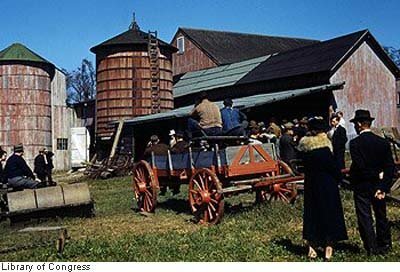 Others in “the country,” including city refugees trying out the rural lifestyle, find they have no real use for a barn and raze it to make room for a garden or more rows of corn. 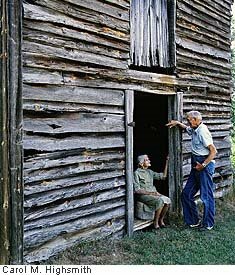 In North Carolina alone, a study found that the number of tobacco barns, estimated at half a million in the 1950s, is down to 50,000 by “the most generous estimate.” Carol photographs about 8,500 of them each year while visiting Carolina for her family’s summertime reunions. But an incredible array of historical societies, professional and amateur architects, Internet Web sites, collectors’ groups, and just plain barn lovers have rescued old barns. The National Trust for Historic Preservation not only helped save hundreds of barns through its “Barn Again!” program, it even staged an old-fashioned barn-raising inside the National Building Museum in Washington in 1994. Needless to say, that building has a really large atrium. Round barns, though, don’t have a broad side. There are at least a thousand of them across America. They have been part of the rural landscape almost as long as European settlers have lived here. George Washington admired them, as I mentioned. He also built one. So did early Massachusetts settlers from an odd religious order called “Shakers.” Others built them throughout the Midwest from the 1880s through the 1920s. 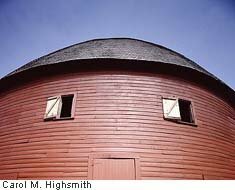 Carpenters discovered that round barns required less stone or wood than rectangular barns, thus saving on costs. Because their roofs are supported by the one circular wall, no columns are needed. So there’s more room for livestock and hay — and dancing! Midwesterners learned, too, that high winds – even tornadoes – that would pulverize an ordinary barn often glance off a round one. 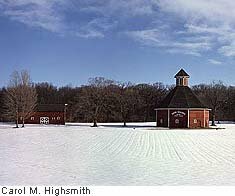 Perhaps the most famous American round barn is a big red one with a green, egg-shaped roof made of cedar shingles. It was built in rural Oklahoma out of burr oak in 1898 by a farmer named Big Bill Oder. In order to bend the boards around the circular frame of the barn, he soaked them for weeks in the closest river. Over the years the round barn was — and still is — the town’s favorite dance spot and one of the most-photographed buildings along scenic, two-lane Route 66 between Chicago and Los Angeles. The Arcadia Round Barn may not be one of the world’s Eight Wonders, but it’s among Oklahoma’s top ten for sure. In the 1970s, the barn was abandoned. Slowly it began to bulge and slump to the east, until a group of citizens bought it and fixed it up. They pounded telephone poles into the ground all around the barn, wrapped heavy guy wires around them and the barn, and pulled until the old red barn was upright again. That caused the roof to collapse, but they made a new one. Thousands of other barns have been restored as well — some for continued agricultural use, thanks to a 20-percent federal tax credit, but many more for other purposes. We’ve run across historic museums, antique shops, real estate offices, firehouses, and bed-and-breakfast inns set up in barns across the country. Quite a few people now live in old barns, too. A few are even born there. (“Hey. Shut the door. Were you born in a barn or something?” “Why yes, I was.”) Most recently in Ohio Amish country, we explored several refurbished barns that a dealer in Amish and other Pennsylvania Dutch goods had moved to the site and connected. 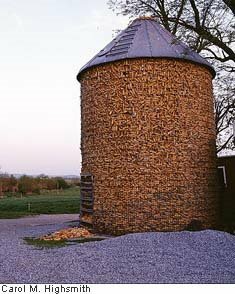 It beats the alternative of a forlorn, collapsed shell or no barn at all, however. Barns that survive on the farm or live in our memories are cherished harvest homes. 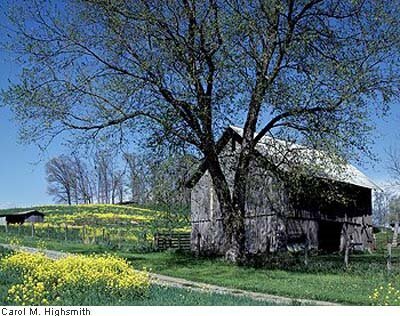 We stop to admire a beautifully preserved one, to pause over a yellowed photograph, to wonder at the hard but honorable work that went on inside what is now a sagging ruin, and to sigh at the erosion of an American tradition that the passing of barn after barn represents. 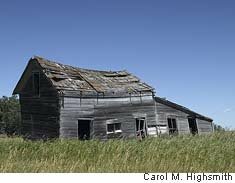 If small farmers keep leaving the land, and bulldozers and wrecking balls keep clearing the countryside for cookie-cutter houses and streetlights and cars, you’ll one day need those old photos, or maybe an old farmer if you can find one, to show your kids what a barn was. 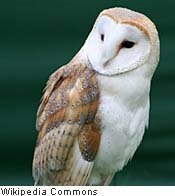 As you know from encountering my “Wild Words” each week, I like and use a lot of unusual English words. In America, one of them needs no definition beyond the mention of a person’s name. And the name is Walter Cronkite. Most of the obituaries of this lion of television anchormen, who died July 17 at age 92, reach for that word in describing him. It has to do with the twinkly qualities of a kindly uncle. Note the “unc” in both words. Genial, unthreatening Uncle Walter — he on the screen and we at home were on a first-name basis, it seemed — invited us onto his knee for story time. 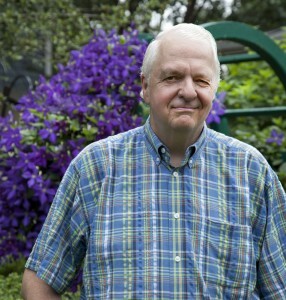 Not happy stories, often, but important ones that we needed to hear. Today’s media environment glorifies action, sizzle, and showmanship. As Tom Knott points out in the Washington Times, the hottest medium, the Web, has as “its principal objective [to] push out gobs of content, create traffic, and inspire comments.” There and on TV, there’s no one who, by consensus, we all turn to, count on, and trust. You like her. I like him. Sets down the street are tuned to a hundred others whom those people prefer. Most of America watched Walter Cronkite, and everybody trusted him. Uncle Walter had no sizzle at all. For 21 years, until his retirement in 1981, he sat stiffly on camera — as you or I would — as if the limelight discomfited him. But we grew comfortable with him. There were few yuks on Managing Editor Cronkite’s CBS Evening News. A touch of bemusement, a twitch of his little moustache, or an arch of his raging eyebrows was as far as he’d go. It’s hardly original thinking, but it bears repeating: When Walter Cronkite signed off “That’s the way it is,” that’s the way America was, all right, that night. I doubt we’ll be using “avuncular” much any more. Gambrel. This is a French word, roughly meaning “meat hook” and is often applied to the style of roofs, especially on barns. It reflects the abrupt change in pitch of the roof. Hex signs. In the United States, hex signs are Pennsylvania Dutch folk art meant, despite their name, to bring farmers good luck, not cast a spell on their neighbors. They are intended, however, to ward off evil and others’ hexes and to “protect” the site from bad luck, which is one way of bringing good fortune. Kudzu. 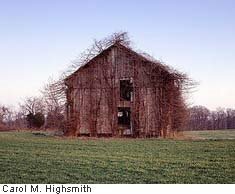 An aggressive vine that can completely cover abandoned structures and strangle trees and other plants. Kudzu was introduced from Japan as a decorative plant at the 1876 U.S. centennial fair in Philadelphia. Little did people know that the invasive species would become a nightmare as it ran rampant, especially in the hot, humid South.